I mentioned a few weeks ago that I am a storyteller, and today I would like to tell you the story of my dog, Bella. 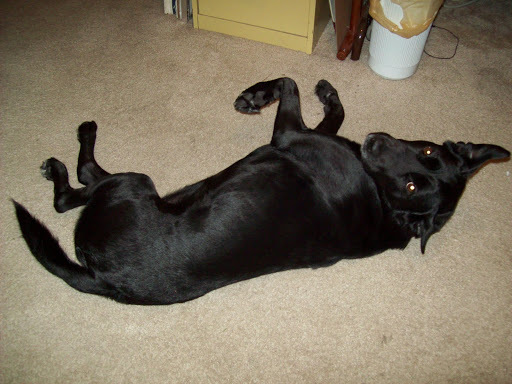 Bella is a very happy, slightly spoiled, fifty-pound, black lab mutt. She keeps close watch out the front windows and alerts us to all passing pedestrians, the FedEx guy, the UPS guy, and, of course, the mailman. She sounds big and fierce and very scary, and we appreciate that. We believe that were any of us in actual danger, she would rush in to save us. At least, we hope that she would. Usually once an intruder/visitor gets past the threshold, she hides behind whomever is handiest. But we still have hopes. Bella came into my life several years ago when an on-line friend mentioned the skinny, half-grown pup that was haunting her alleyway. She yearned to play with the children in the backyard, but was so scared of men that she wouldn’t let the dad take the trash out. I lived alone in a small duplex and had been telling myself that when it was time for me to have a dog, I would know. When I saw the internet posting, and that the family lived nearby, I decided this must be the sign I had been waiting for. I picked up dog food, and a couple of doggie bowls at the grocery, and drove over to their house. The mother and I managed to coax/push/pull/carry the nervous, skinny pup into the back of my mini-van. I took her home, gave her a bath, and then belatedly decided to check the integrity of my back yard fence, as I didn’t want to leave her alone in the house the next day while I was at work, since I had no idea how housetrained she might or might not be. She was very nervous about being left alone for even a short time, and barked and jumped against the door all the time I was outside. Bark. Jump. Bark. Jump. I decided the backyard would probably hold her, and headed back inside, only to find that with all her jumping, she had flipped the deadbolt locked. It was a French door, so I resigned myself to breaking one of the panes and paying for its replacement. That’s when I found out that those little windows don’t break nearly as easily as in the movies. After several unsuccessful attempts, I went to a neighbor’s house and called a locksmith. Bella was very happy once I was back inside with her. The locksmith was very happy with his after-hours fee. Several months later, I moved into an apartment and Bella went to live with my daughter, Janette, where she had a doggie door, a large backyard, and two barking buddies. It was, indeed, doggie heaven. And that was where we found out that Bella was not just a barking machine, but a fierce huntress. Unfortunately for Janette’s peace of mind, this included Bella sharing her trophies with the pack leader, who was, of course, Janette. She always knew when to expect to find her share of the kill, because Bella would be very excited upon the pack leader’s arrival home, and run back-and-forth, back-and-forth between the front door and wherever the trophy was waiting. This was usually some lesser portion of a squirrel, and Janette was very glad that the possums and raccoons seemed to be too much trouble for Bella to carry inside. The animal control number was pinned up on the refrigerator door for when those unfortunate critters needed removal from Bella’s hunting grounds. Janette taught Bella to sit and patiently wait for doggie treats. Bella learned on her own to talk in order to be rescued from my granddaughter’s affectionate attentions. Bella knew that Eva, small as she was, still had higher pack status and so could not be directly corrected. So, Bella would vocalize her need for rescue when her floor-lounging was interrupted by a toddler using her for a pillow or handy seat. When I moved to Florida, Bella stayed behind in Texas, but last year she finally made the trip, too. I worried that she would feel lonely being the only dog, but she seems to think that this is a fine turn of events. She doesn’t have to eat her food all at once to keep it from going missing later. She has her own bed that she is never displaced from. She gets a doggie biscuit every morning. She never has to jockey for position in the “don’t pet him, pet me” competition. She has learned how to shake and sit up on her back legs in order to get leather doggie chews. And she has several big windows across the front of the house to help her monitor all sidewalk trespassers. She doesn’t seem to miss the doggie door too much, either. When she wants to go out, she’ll let one of us know. If her need to go out is dire (official doggie business, bark at encroachers, sit on the lanai and watch the rain), she will use her conversation skills to tell us that it’s very important. She also has different barks for different applications. There is the “intruders in adjoining backyards” bark, the “trashmen are taking our stuff away” bark, the “neighborhood doggie gossip update” bark, and then, of course, the “let me in, please” bark. And when Mother is the only one home, Bella knows to go to the sliding door off the living room to announce herself, because Mother is a bit hard of hearing and can’t hear her from the back of the house. In the past, Mother has been nervous around larger dogs, but she is quite taken with our Bella. Bella keeps Mother company during the day, gives a good bluff to passing strangers, and has doubled or tripled Mother’s daily physical activity. She has also increased my level of activity, as my formerly irregular vacuuming is now a near-daily event in order to keep my home as fur-free as possible, and weekly doggie baths have also been added to my routine. That’s OK, though, because we love our Bella, and it’s really nice to have a dog around the house again. I recently joined the Top of the Morning Toastmasters group. It meets right here in Oldsmar, at 7:30 on Wednesday mornings. I understand your disbelief in the idea of me being anywhere (besides my own bed) voluntarily at 7:30 a.m., but Wednesday is also the day that Mother goes to the senior center, and I have to set my alarm for 6 a.m. to make sure she’s up and has coffee before her van arrives. I’m up anyway, so it seemed like a good plan. And so it has proven to be. This morning I gave my Icebreaker speech, which is the first project in the Competent Communicator’s workbook. I have actually done this project before, but that was over two years ago in Kerrville, so I thought I’d just start all over, since I hadn’t gotten very far anyway. The Icebreaker Speech is supposed to be for four to six minutes. I ran through it last night with Steve, who clocked me at a little over five minutes. He cautioned me about being nervous and talking faster than normal, which would speed up my time. This morning, I concentrated on speaking at an even pace, and ended up talking for 8 minutes and 12 seconds. There’s a timer’s light box that gives the speaker cues on how much time is left depending on what lights are lit. I didn’t even notice the light box until all the lights were lit – and I had no idea how long they had been. Oh, well. I’m including the prepared text of the speech below, but since I didn’t practice it as much as I should have, it’s not exactly what I said. I missed a couple of things, and added a couple more, but it’s basically the same. One of the things I found very interesting was my opening. I’ve been trying to figure out who I am and where I am going, outside-world-wise, for the past few years. Maybe this is the answer, and I just have to figure out exactly what that means. My name is Kay St. John, and I am a story-teller. My friends and loved ones are well-acquainted with the phrases “I have a story about that” and “Do you want the short version or the long version?” The short version will tell you all you need to know, but the long version is usually much more entertaining. The memories of my childhood and the knowledge of events in my family are stored in my brain as fables, cautionary tales, fairy tales, and bedtime stories. I’d like to share a few of those with you this morning. When my Papaw, Daddy’s daddy, was a small child, his father was killed in a logging accident. He left a widow with three young children, one still a babe in arms. Her husband’s family members offered to take the older children, as they were old enough to put to work but she would have to figure out something to do with the baby. She thanked them, kept all her children with her, and did laundry for men in the logging camp to support her family. This story taught me that mothers in our family take care of their children. When Momma and Daddy first married, he was fresh out of the Navy, and worked a small farm as sharecroppers. I grew up hearing about how Daddy had chopped wood for the stove and Momma had used the pump on the porch to draw water to be heated on that wood stove for my sister’s baths when she was a baby. After a few years, Mom and Dad packed up and left Magnolia, Arkansas for Lubbock, Texas, where my brother was born. Mamaw, Daddy’s mother, was very upset and told them they were going to starve to death in Texas. Daddy replied, “What’s the difference? We’re starving to death here.” That story taught me about taking initiative. After Lubbock, where my brother was born, the family moved to Houston, where I was born. When I was about a year old, Daddy was laid off from his job. He went to Dallas, where he found work, worked for a week to get a paycheck. Mother had packed up the house while he was gone, so when he got off work that Friday, he rented a truck, drove to Houston, they worked all night packing up the truck, and then drove back to Dallas with Daddy driving and Momma, my 14-year-old sister, 7-year-old brother, 1-year-old me, and the dog, all in the cab of the moving truck. When we got to Dallas, to the house Daddy had rented, they unloaded the truck so that it could be returned within the 24-hour rental period, so they wouldn’t have to pay the 2nd day truck rental. This story taught me that sometimes you’ve just gotta do what you’ve gotta do. With my sister being fourteen years older, I heard many stories about her childhood and adolescence, many of which had to do with her being a normal rebellious teenager – and being vocal about her opinions and intentions. I don’t know that there was much difference in how many times each of us was grounded as a teenager, but I was NEVER grounded for something I had yet to do. The stories of my sister taught me that if I could control anything, I could control what came out of my mouth. Now I tell my own stories – of how while my children were growing up, I got my bachelor’s degree on the 17-year plan. I attended school and worked part-time, taking college classes in between PTA meetings, piano and swimming lessons, and serving as Lutheran Sunday School and Vacation Bible School teacher, Cub Scout Den Mother, Girl Scout Leader and High School Band Mom. I sewed summer play clothes, Easter dresses, and Halloween costumes. My alter-ego was OmniMom – omniscient, omnipotent, and omnipresent Mom. I loved it. My degree plan was based on the idea that as I had been reading anthropology, sociology, and psychology for fun, it would be nice to have a piece of paper indicating that I knew a little bit about at least one of these subjects. After only four years at the University of Texas at Dallas, I graduate with a BA in Psychology, with a Sociology minor. I spent five years working in a small halfway house for people coming out of the psych ward, and then another five years working at a much bigger halfway house for parolees and probationers. My pay was about the same, sometimes a bit less, than I had made as a bookkeeper while I was working my way through college. And after ten years, I was quite ready for a break from direct client contact. I went back to bookkeeping. A little over three years ago, my long-widowed mother decided she no longer wanted to live by herself way out in East Texas. I had moved from Dallas to Kerrville shortly before that, and we agreed that she would sell her house and move to Kerrville to live with me. I thought I would be getting a roommate, but during the move I realized that she really shouldn’t have been living alone as long as she had, and I had to become accustomed to being a caregiver for my mother. We have both come a long way in our new roles since then. I also have a great story of how I came to move to Tampa, but it’s a pretty long tale in and of itself, so I will save it for another time, except to say that I will be getting a new name in less than three weeks.